We’re really pleased to announce that we’ve been selected for the Outlandish Fellowship to help local cycle campaigners by expanding our collisions data pages into a broader resource covering more types of data (e.g. traffic counts, pollution) and add lots of new ways to access it. Getting more people cycling brings a more sustainable and efficient transport system, improved public health, and greater access to employment. However, in the UK, cities have failed to make space for cycling on our streets, preventing mass uptake. We know from our own activity as campaigners in Cambridge, that making a good evidence­-base for reallocating roadspace or challenging poor developments involves significant work. For instance, developers often claim that their route has “good connections to the local cycle network” whereas in practice we know that this often means a shared-use path that is hard to access. We lack the data to make a strong case that, for instance, a combination of a high collision rate, congestion, pollution in an area means that a developer or a Local Authority needs to improve their plans. Of course there remains the need for making arguments based on broader policy, such as that cycling should be prioritised as a positive and healthy form of transport, but hard data for specific cases helps backs this up. There’s lots out there that could be useful for cycle campaigning. Things like collision data (which we’ve already done a bit of work on), traffic count data, travel time data, census travel data, on-street counts, etc. Imagine if, instead of having to search these out and find someone technical to process it, you could simply point and click, with national coverage? This data is becoming available but it’s very scattered, meaning that correlations are hard to make. It’s often in raw formats that need significant work before it can be understood, or hidden in Local Authority websites that are not sufficiently flexible or easy for non-specialists to use. Often it’s not arranged for the kinds of tasks that cycle campaigners specifically need. We’re aiming over time to build up a multi­functional resource to help build this case, enabling users to a build and link to an interactive display of the relevant data (involving multiple layers, clickable points, reports, summary info) for a particular location or route, that they can use in their advocacy and liaison work. Our plan is that it would be available for embedding in local campaign websites, exporting to reports, used in apps, and so on. Justification of removal of one-way street restrictions for cycling. In previous decades, traffic planning favoured one-way streets as a way to regularise traffic flows and avoid rat-running. However, the side-effect is to stop easy cycling. If we could compare collision data easily in a particular location, we could show how streets that have been made two-way for cycling haven’t caused a safety hazard. Worsened likelihood of collisions in areas with an existing poor record. A supermarket developer wanted to open a local store under a just-in-time delivery regime in a high street with a narrow carriageway that has heavy traffic and high pedestrian and cycle flows. A good evidence base, combining flow level data, Origin/Destination data, collisions and traffic data delay data, would have enabled us to argue that the developer will need to amend their delivery plans to be more sympathetic to the local circumstances. Higher levels of pollution in areas with significant problems already. Areas with many schools particularly need to avoid pollution. A developer proposes a new estate in such an area but fails to provide good connections into the site for walking and cycling. A better evidence base, combining socio-economic data, school travel data, pollution and cycling levels would help us convince the Local Authority that the developer needs to provide this connectivity. What changes can people expect? Completely reworking the search facility so that it’s actually useful – currently it’s stuck in a prototyped state, with lots of non-useful fields. This will mean that common scenarios like “Collisions between a date range in area X” are possible. Adding typical scenarios as new front-end ways to access it. Currently, it’s very map-based, whereas we want to enable common use-cases much more easily. Making everything Local Authority -aware. Currently it’s all manual boundaries, but we’d like users to be able to do things like compare casualty rates (and other data – see below) between areas. Adding a better way to import the data. Currently, updating it each year is not as easy as we’d like, and new data types (see below) need to be supported. Making all the above available through a more generalised Advocacy data API. In fact, this will be the system powering all the above! We’ll be giving updates via this blog over the coming 6 weeks – stay tuned! Blackfriars Bridge, scene of many unfortunate collisions over many years. With the new data platform, it will be possible to make easy comparisons about how the introduction of the new Dutch-standard cycle infrastructure just built reduces these collisions. 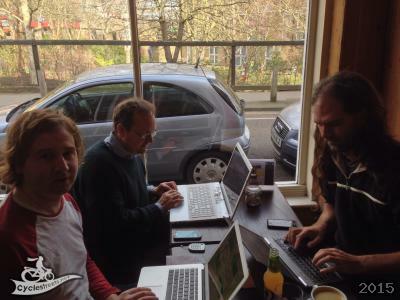 Outlandish is a web agency based in Finsbury Park, down the train from us in Cambridge. The members of Outlandish want to unleash technology’s potential to make the world a fairer, better place. It’s a worker co-operative and invests all surpluses into projects that help achieve the members’ goals. They build digital applications and websites for companies, charities and universities that make their lives easier and help them to discover and communicate new insights from their data. Outlandish has made available fellowships for people who are using the Internet and digital technologies to address social issues. The fellowships include funding and other forms of support to allow participants to start their own projects. The aim of the fellowship is to support work that matches the mission of Outlandish, and to expand the network of people that they actively collaborate with. We’re really proud to be in the first set of Fellows, and it’s going to be great to be working with a co-op! Our main developer on this project is Martin, doing most of the work, as the Outlandish Fellow. He’s being helped by Simon (CycleStreets’ other principal developer), when he can be wrestled away from interesting routing quality challenges like turn delays that we’ve been working on recently. A version of this blog post also appears on the Outlandish blog. CycleStreets is supported by a whole range of people, whether in terms of mapping, coding, feedback handling, photo curation, awareness-raising, donations, grants (as reported via this blog), and more. One area is the great support that our hosting company, Mythic Beasts, provides. Over many years, they’ve given us various bits of freebie hosting, and it’s also been great to be able to get some friendly advice once in a while on hardware scaling, as traffic to our systems grows. For instance, since the early days of our project, they’ve supplied our development server which we use for various infrastructure requirements like monitoring and some source control. They’ve supported some of the VM hosting requirements of our Cyclescape project. Another example has been a large VM with masses of RAM for trying particularly intensive processes. They’ve also been flexible as we’ve upgraded machines and VMs over the years. Running a journey planner covering three routing modes (actually it’s more than three, because of multiple speeds) over a large geographical area (we’re not just UK these days, lots of other areas are enabled, even if they’ve not been formally ‘launched’ as such! ), for both our own website/app as well as third-party mobile apps, with proper redundancy, means that hosting is a fairly significant cost for us. Hosting in particular is our main constraint on expansion towards worldwide coverage. Routing requires lots of CPU, large amounts of RAM (when you plan a route it barely touches the disk, for speed), and plenty of disk space (because OSM data is growing all the time). Some of our hosting uses fantastic Mac Mini hosting, which gives all this at low cost – we believe it works out significantly cheaper than ‘cloud’ hosting. So all the help we can get is welcome. Though we do our own sysadmining, Mythic have always provided us with peace of mind, through excellent and responsive support, in case of any problems that might arise. PS We welcome donations in support of the project, whether financial or in kind (e.g. more hosting is always needed!). Although we don’t accept advertising or paid links on our sites, it is our policy to acknowledge significant donations from companies or organisations through this blog. Do get in touch! This weekend we attended the Smarter Travel Live hack weekend. 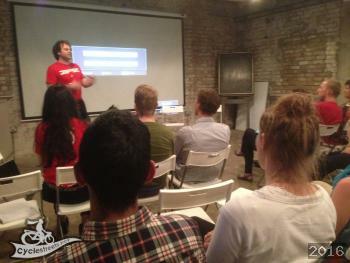 The aim of the hack event was to produce an output to support one of five challenges set by various organisations. We chose to tackle the Carplus challenge which was to try and find a way to reduce the use of cars as the primary transport means around the Lake District. It soon became apparent that as a group we felt that a hire and sharing scheme would work best for the area, therefore we set off to try and gather evidence of how popular the scheme could potentially be as well as providing evidence to where the scheme would best be suited. We were provided with a travel survey which listed the origins and destinations of c. 8,000 visitors to the park, this listed the mode of transport as well as the number of people making the journey. From this data we were able to visualize the flows of people to the park as shown below. From this data we then began to summarize what the most popular locations were in the region. 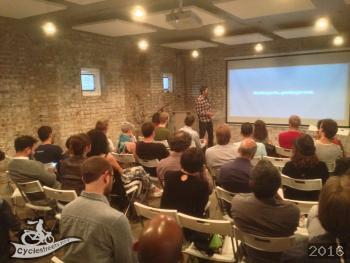 For this we set out a criteria that popular locations had to attract more than 100 visitors from the data. The results can be seen below. This then lead to the question, where do current cyclists cycle in the Lake district? By using the flow data and some clever use of CycleStreets API we were then able to allocate all of the current cycle flows to the route network. The approach, using origin-destination data routed to the on and off road travel network using CycleStreets.net, is similar to that used in the Propensity to Cycle Tool (PCT). An early draft of a report describing the methods in more detail is available. The analysis showed the the current popular cycle network had one main entry point to the lake the district, the thick red line flowing from Milnthorpe, through Kendal and out to Windermere. Beyond the corridor the data supported evidence that flows up to Ambleside, Grasmere, Coniston and Hawkshead were also popular. The next question to answer we decided to answer involved trying to discover which car journeys could potentially be replaced by cycle journeys. Using the flow data and R code we managed to find all of the car journeys in the data set that were under 10km. Once again, using the CycleStreets API these were allocated to the road network and then visualized. This visualisation supports the idea developed in from the cycling data that cycling could be popular in the north Windermere area. A 10km journey would take an estimated 30 mins when travelling at a reasonable cycling speed of 12mph (19kmh). These two visualizations therefore supported out idea that cycling could be a popular activity in the north Windermere/ Kendal corridor area. However what we had overseen was where should this system be implemented e.g. hire locations and how should it be carried out e.g. new infrastructure or rework existing infrastructure. Some research into cycle hire in the Lake District was carried out and we discovered that there was already a fairly large economy in the region, however the system does not support A to B trips, it is primarily for users to hire bikes from a location and drop off at the same location. Plans have already been suggested for cycle hire in Kendal. What we therefore propose is that a cycle hire system could work by working with the current bicycle hire network (see below, these are current e-bike cycle hire locations from electric bicycle network) to support A to B transportation by bicycle. Using all of this analysis we then created a ‘core’ cycle network based on the popular destinations, current cycling, car journeys less than 10km and the existing hire locations. This is where we suggest cycling infrastructure should be placed initially. Once this is built extentsions could be built to Grasmere, Coniston, Troutbeck and Grizedale in order to link up to other popular locations. Our hack has therefore provided evidence to support a cycle hire network in the Lake District. The analysis has suggested that cycle journeys could replace a large amount of car journeys in the region, therefore reducing congestion. The initial brief stated that people wanted to get out of their cars when they were visiting the Lake District, this has provided a potential solution to that need. We put all of our data, code and visualisations on Github. You can view the map of all the spatial data created for the project. Thanks to Landor and Transport API for organising such a great event. Posted in API, Community, Local Authorities, Open data | Comments Off on TransportHack @ Smarter Travel LIVE! How can people help improve mapping used for CycleStreets? Finding out about good cycle routes – where it is safe and convenient to cycle – means availability of good maps and the knowledge of local people about their area. We’ve created a new edition of our community mapping guide, Cycle mapping for cycle routing, freshly updated for 2014. The brochure explains how people can help improve CycleStreets and OpenStreetMap to help people find their way. For the new 2014 edition, we’ve replaced screenshots and examples for the newer iD editor and made other updates. You can also browse it in magazine-style on Issuu. Thanks to our brilliant designer friend, Ayesha Garrett, who has done the updates to the design work. The original guide was in conjunction with Cycling Scotland, and some of the updates have been made to complement the West Sussex cycle journey planner which we run for that Council. CTC, the national cycling charity, has launched a new cycling infrastructure map to help communicate what makes good conditions for cycling and where improvements need to be made. CTC have linked up with CycleStreets to ensure these locations are also saved to the CycleStreets Photomap. Chris Peck, CTC, explains this new initiative. What is the Space for Cycling campaign? London Cycling Campaign created Space for Cycling, which in London is focussing on lobbying candidates in this year’s local elections. CTC is taking LCC’s London-born campaign nationwide, and is coordinating the campaign to seek commitments from local politicians to provide Space for Cycling, in conjunction with the Cyclenation federation of local campaign groups around the UK. The campaign is funded by a generous grant from the cycle industry’s ‘Bike Hub’ levy, run by the Bicycle Association, and by private donations. 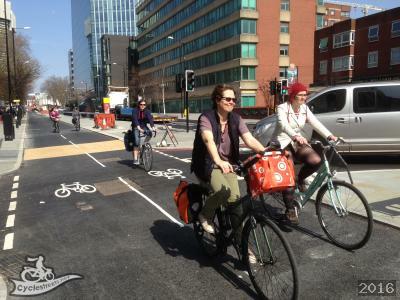 Space for Cycling calls on councils to improve our streets so that anyone can cycle anywhere. But what does that mean in practice? CTC wants your photos and examples of infrastructure that’s good or bad to explain to councils what works, and what needs improvement. You can submit the photos to the map, and write to councillors, challenging them to make Space for Cycling in your area. If you’ve got photos of examples of infrastructure for cycling – whether good or bad – CTC wants to see them. Beds for Cyclists, the UK’s cycle friendly accommodation community, has teamed up with us to offer cyclists on the move cycle-friendly accommodation information on their mobiles. Cyclists can now find cycle-friendly hosts on the CycleStreets app and Bike Hub cycle journey planner apps. Beds for Cyclists is the UK’s cycle friendly accommodation community created by cyclists for cyclists. It’s a fantastic resource for cyclists, and to have this information at your finger tips when you’re out on the bike is going to help a lot of tired riders find a good place to stay. Both apps use the same OpenStreetMap data to provide the best cycle journey planner facility on the market. The A to B route planners offer three different routes; the Fastest, Balanced and the Quietest Route, giving riders of different experience a chance to find a route that suits them. Beds for Cyclists has also been utilising this journey planning software. Each cycle-friendly host now features a journey planner directly to their door powered by the CycleStreets journey planner. This allows users to plan route from any location to the cycle friendly host’s door with a few clicks. Beds for Cyclists’ hosts also now have local cycle hire providers shown on their profiles. In partnership with Cycle Hire Info the three closest cycle hire centres within 20 miles are listed on the host’s profiles. It is notoriously difficult in the UK to travel on public transport with bikes and this will overcome that dilemma for many people wanting to have a cycling holiday. Beili Neuadd B&B and bunk house shows off these new features very nicely. With the world’s biggest bike race underway and the cycle season in full swing, Beds for Cyclists is pedalling at full pelt to help others get away this summer on their bikes. We’re giving a talk to Green Enterprise, in Cambridge, today (Monday 28th January 2013). Do come! Full details are on the Green Enterprise website. Venue: Friends’ Meeting House, Jesus Lane, Cambridge. Cambridge is only an hour from London by train, so well worth a visit.